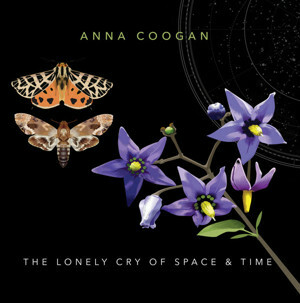 Album Review: Anna Coogan, "The Lonely Cry of Space & Time"
This third album from singer-songwriter Anna Coogan defies the notion that “rock opera” is a concept of the past, as The Lonely Cry Of Time & Space seems to have that kind of overall feel – a whole concept, rich with melody, a story and a vast, lyrical landscape. The album, a virtual two-person effort which features Willie B. on drums and Moog bass, combines Coogan’s three-octave soprano vocals, electric guitar soundscapes and pointed social commentary into a fierce cohesive piece which combines the personal and the political, in a musical hybrid of rock, country, pop and classical opera into a unique whole. Her new direction was born from her series of performances in her adopted hometown of Ithaca, NY, in which Ms. Coogan and Mr. B created live musical accompaniments for vintage silent films. The ambiance of the title track has a slow, enveloping texture with the delay-laden opening verses that then kick in to a harder edge as the song progresses, then pulling back. There’s something of an early ’80’s new-waveness about it; I can easily imagine hearing it on WSIA, our local college station, on a Friday night; “Collateral” has a sinister surf vibe and the way Ms. Coogan’s voice arcs works perfectly; “Meteor” is another new wave-styled piece, with its poppiness and groove (and is the highlight of this album, to me – immensely catchy) and “Follow Me” has a late-period R.E.M.-mourning feel (think Reveal or Around The Sun). One of the most enjoyable aspects of this album is the production, especially with the sound of the guitars, which have a purity; a crispness about them that I absolutely love. This isn’t an “easy” album to absorb on first listen; the complexity, the different styles of music can be disconcerting – not in a negative way – it simply throws you off, initially. But after spending time with it and listening/re-listening, you then begin to take in the individual songs and find they have a staying power. Which, to me, is something I think every musician strives for. Certainly, I think Anna Coogan wants these songs to live with those who want to hear and know.